Home > Cloud Computing	> Who is Hyping Cloud Computing? You Will be Surprised! 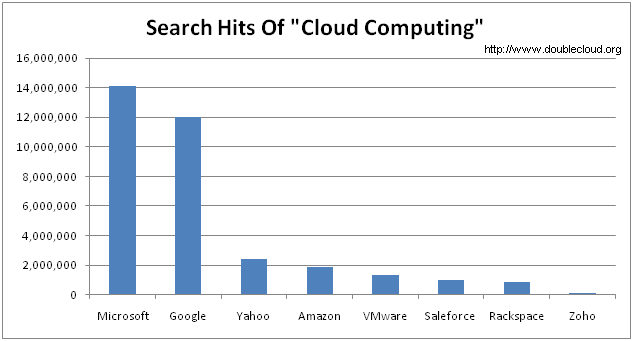 Who is Hyping Cloud Computing? You Will be Surprised! I came across a blog “5 things VMware must do to fend off Microsoft.” The author Jon Brodkin listed the following musts: cut prices, improve Security, win the desktop war, simplify management, don’t overhype the cloud. Here is a response to the article by Steve Kaplan. Because I am working on cloud related projects, especially I am the creator of the vSphere Java API that manages the “cloud operating system,” I am curious to know whether VMware is overhyping the cloud computing. Instead of expressing my opinions, I decided to do a simple research using Google and Wikipedia. To my surprise, the “cloud computing” page does not include VMware in “Cloud computing logical diagram.” The companies listed are Microsoft, Google, Saleforce, Amazon, Yahoo, Rackspace, Zoho. Well, that is good for me to do the next step. To save you time, I captured the screenshots of each search, and list the most important parts we are interested as follows. How do these numbers compare to each other? Take a look at the following bar char diagram, and you will have a much better sense. I know your comparison probably wasn’t supposed to be representative or accurate, (so forgive my possibly superfluous rant) but this kind of search is utterly skewed.“Microsoft” is mentioned on pretty much every IT related website somewhere. Compare “cloud computing” and “cloud” combined with site:vmware.com and site:microsoft.com and you’ll see that VMware and Microsoft aren’t that far apart. Besides, it’s VMware whose main page and most non-technical subsites have cloud here, cloud there, cloud everywhere in the typical marketing-hype manner. The comparison is not an exact index of “hyping,” mainly for fun. From the search hits, however, we can have a good sense of how much effort each company has invested in promoting cloud computing. I agree with you that Microsoft is mentioned in almost all IT related websites. I think these sites didn’t associate Microsoft with cloud computing by themselves, but Microsoft itself promoted the cloud messages to these sites. I think a little hyping is not a bad thing especially in the early stage of a disruptive technology. The general public needs information on cloud computing anyway.